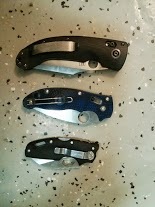 How to choose the right pocket/folding knife. A knife is an important tool both in survival situations and in daily life. I think of the scene from the movie "Cast Away" when Tom Hanks is handed the keys to his Jeep with the small Swiss army knife attached to it. The expression on his face communicates that even such a small pocket knife would have made his existence on that small island more bearable. I firmly believe that you should have the right tools before you need them. When working on a vehicle and you need a shorty box wrench, but have to make due with a standard wrench, it can make the task much harder and more annoying. Having just the right tool can make your work enjoyable or at least bearable. I believe the same goes for knives. Any knife will do in many situations, and many knives are good for many different jobs, but just like having the right tool when working on a vehicle, having just the right knife will make the job easier and even enjoyable. For a daily carry pocket/folding knife the basic jobs that I need it to perform include opening boxes and other packaging, odd unknown tasks and for it to be adequate for self defense. For quick and easy access to my knife it must be clipped to the inside of my right front pocket and be easy to open and close with one hand. It would be nice for it to be lightweight as well. Quality is very important to me in both durability and reliability as well as fit and finish. The shape of the blade should be a consideration as well. Although there are many, many different options the knife that I have chosen for this job is the Spiderco Manix 2. This blade is just over 3" long and is made from a high quality steel. The slight curve of the blade lends itself to many tasks including self defense as the tip of the knife is tapered to a fine point. The large hole in the blade is used to open the knife with one hand and the locking mechanism on this knife also allows it to be easily unlocked and closed with one hand. The handle is made from a lightweight but very strong fiberglass reinforced polymer and the scales on the sides work great to keep the knife from being slippery with wet or sweaty hands. The shape of the handle is very comfortable and fits my hand well. The spine and the choil (the choil is opposite the spine) both have fine gimping on them that grabs my thumb and fore finger well when 'choking up' on the knife...and I even like the color. The best part about this knife is that it's made in the USA! The locking mechanism is important to consider. There are several different types of locking systems. Some are stronger than others. The strength of the locking mechanism is not as critical a feature to me in a daily carry knife as are the ergonomics and functions of the knife. Typically a knife with a liner lock or a lock back can not be easily closed with one hand but are typically a stronger way to lock open a knife. The length of the blade is an important consideration as well. The straight forward answer from me for the best all around blade size for everyday use is between 3 and 4". Again, having the right tool for the job is important, but when carrying a daily carry multipurpose knife bigger may not always be better. Keep it to between 3 and 4" in length and you shouldn't want for more. You'll need to know the laws of your particular area to know what the legal length of knife you can carry. For example, in Chicago, the laws limit the length of the knife to 2" or under as I understand it. So, in this case, I wouldn't recommend anything under 2" if that's all you can carry. The is my second choice for a daily carry knife. It is the Benchmade Onslaught. 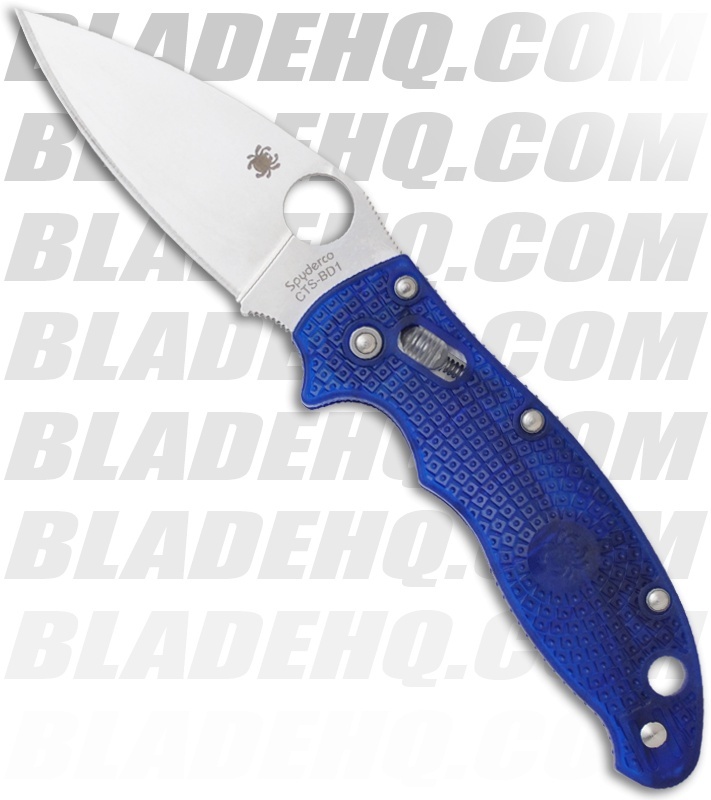 This blade measures over 4" and is more than twice the weight of the Spiderco. It is also more than twice the price of the Spiderco. I carry this occasionally as I love the look and feel and the quality of the fit and finish are excellent. The slight curve of the handle is very comfortable in my hand and it feels very natural. The extra weight of this knife tells me that it is a quality piece of craftsmanship. The blade shape is similar to that of the Spiderco above but has more of a 'clip-point' which lends itself to defensive uses. Because of the larger size of this blade I have used it to carve the Thanksgiving turkey. The locking mechanism is different but is employed in the same manner which makes this knife as easy to close with one hand as the Spiderco. 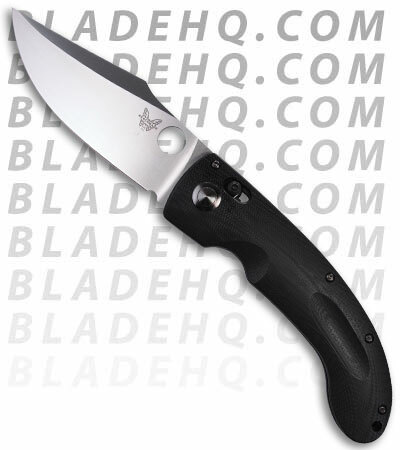 The hole in the blade on the Spiderco is larger than the hole on this Benchmade which makes the Spiderco slightly easier to open. The difference between a 3" and 4" blade may not seem to be much but when you compare them side by side the overall difference in size can be significant. With a longer blade the blade can often (not always) be both wider and thicker and the handle needs to be longer to properly cover the blade when closed. A knife with a blade that is just an inch longer may appear to be much larger overall. One particular time I was carrying this Benchmade knife. I pulled it out of my pocket to use it for something trivial. A friend standing next to me commented; "I wasn't surprised that you had a knife in your pocket but I am startled by the size!" I hadn't really thought that the knife was excessively large but I can see how others would possibly feel a little intimidated by it. If intimidation is your goal then a larger knife may be the right choice for you; but you may also want to consider what effect it may have if you choose to deploy your knife in a public place. Heading the other direction in size is another knife that I regularly use. 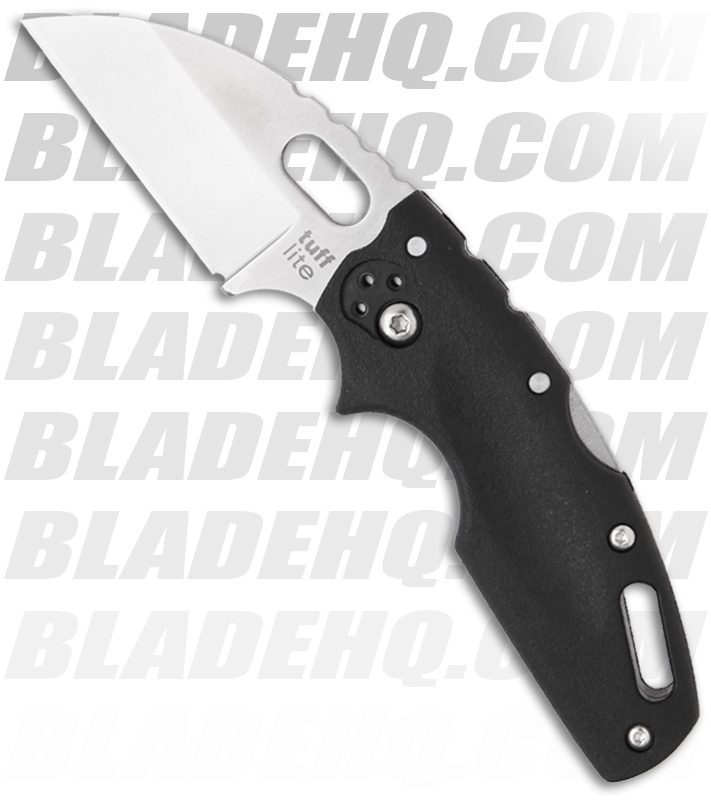 This is the Cold Steel Tuff Lite. This knife blade is 2.5" in length and has a straight blade edge. The locking mechanism is the lock back style which Cold Steel touts as the strongest available. This knife is a great choice for daily carry with utility in mind, and, because of the straight blade and strong construction, is very useful as a replacement, and a more durable substitution, of a razor knife. This is not a great defensive blade in my opinion because of the drop point. Because of it's smaller size and lock back locking mechanism it is difficult to operate with one hand. When gripping the unfolded knife my hand covers the entire handle with my thumb extending onto the gimping (jimping) on the spine up onto the blade so there is truly only one way to properly hold this knife. 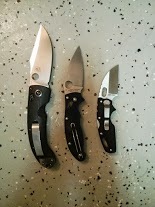 Here are side-by-side comparison photos of these three knives. This post, nor this blog, are meant to be a medium for gear reviews. I am referring to these specific examples in order to point out the details on a knife that are important considerations for me and may be for you as well. There are many high quality, high value knives out there. The brands that you see on this and other posts are brands that I have chosen to purchase. They may not be your preferred brand of knife So I want to be clear that there is nothing wrong with that. I am only attempting to point out features for you to consider that may help you to choose just the right knife. Here is a knife that I carried for over 10 years. This is a Victorinox Swiss Army Swiss Champ. It has a little bit of everything but doesn't do anything very well. It's a great Boy Scout knife, which I was at the time I purchased it. I love this knife! It was part of my daily life for many years and it was well used. I'll keep it until the day I die and then it will be handed down to my Son. The quality, fit and finish of the Victorinox brand is second to none. Don't buy anything less! This, or another version of the Victorinox Swiss Army brand knives should be the first knife you give to your children. I received one when I was young and the first thing I did with it was cut myself. It was a learning experience. I remember being very nervous when I first started exploring its features. I remember being scared that I was going to get cut, which I did, but there was only one way for me to learn how to use and handle a knife. 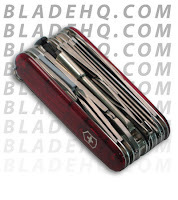 This is the Victorinox Swiss Tool. 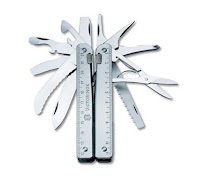 In my opinion this is the best quality Multi-tool available. I am biased because of my previous experience with the Victorinox brand but my overall satisfaction with the quality, durability, reliability and warranty of the brand is uncompromised. 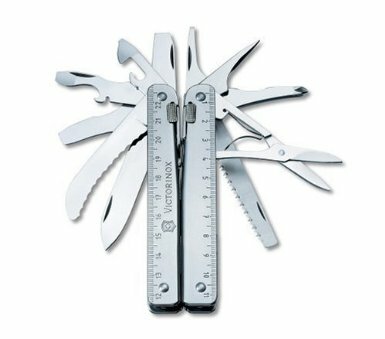 While any multi-tool does not replace a toolbox full of tools I find it invaluable to have an entire array of tools at my fingertips. As you may have noticed the knives pictured are plain satin blades. There are no serrations on these blades and none of the blades are black. Actually, the Swiss Tool has both a plain blade and a serrated blade just as I feel it should be. When you need a plain edge blade serrations will just get in your way. A blade with both serrations and a plain edge on the same edge may be a good choice for a tactical or defensive knife but is not a great choice for an all-purpose knife. A double edged dagger style knife with serrations on one side and a plain edge on the other is a better choice but is also a more dangerous choice as you do not have a flat spine on one side to work with. A plain edge will work fine where a serrated blade will but the inverse is not correct. A serrated edge will not work well when a plain edge is needed. Serrations are excellent for cutting straps and ropes and are good for defensive weapons as well. A plain edge blade has far more uses. The most useful place on a knife blade for a plain straight edge is closest to the choil/handle. The further away from the handle the straight edge is located the more leverage you will need to apply. My conclusion is that a plain edge is the best choice for an all-purpose daily carry knife. As for the color of the blade a satin finish knife blade will show less wear and tear than a black coated blade. Many knives are coated black to protect them from rust as they are made from a 1095 or other non-stainless type of steel. Many survival and other fixed blade knives are made this way. I'll expound more about that in my next post which will be about fixed blade knives. I choose not to make a black coated blade my daily carry blade as it will show the wear and tear of daily use as the black coating wears off from use. A satin or otherwise un-coated stainless grade steel blade will not show as much wear. A coated blade will have it's advantages in a tactical application by reducing/eliminating reflections and glare from a shiny blade. As I mentioned before, the appearance of my daily carry knife is an important consideration when I consider buying a knife. Keeping it looking nice is something I take into consideration. The vast majority of folding/pocket knives are made from a version of stainless steel. There are many different types of steel available. Without getting into the details of all of the different types I will just say that you get what you pay for. Unless you have a specific need to be met that only a certain type of steel will meet, as long as you don't buy a cheap knife, you will get a good or even great quality steel. The different types of steel are rated for their corrosion resistance and edge retention, among other traits. For a folding knife choose a steel that is 440C quality or higher, preferably higher. those are some nice knives you got there. What should I keep and what should I throw away?